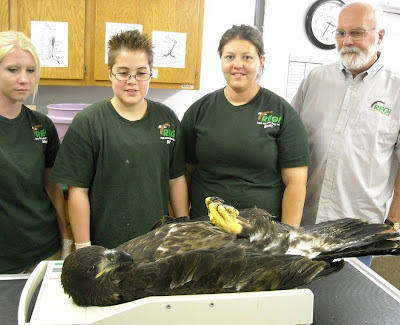 (Photos: Stevens Point Bald Eagle eaglet is weighed when admitted. We use a baby scale and they are usually very cooperative laying still. No sedation is used in case you are wondering. Katie, Natasha, Lance and Steve look on. Photo below: Head shot of the young Bald Eagle. This has been one of those few days where you feel like you are on a roller coaster. One minute you have GREAT even TERRIFIC news and the next something horrible comes through the door and within a minute there is a call about an animal abuse situation that is intolerable and very literally within minutes after that you are putting food into the mouth of a precious little barn swallow so filled with innocence and enthusiasm of just being alive. Then the whole cycle starts all over again. 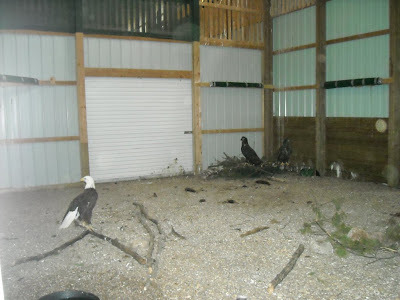 On the Terrific end of things, the young Bald Eagle was put with the foster dad and other eaglet that is already in the rearing chamber. Things went perfectly for the newly formed little family. While the photo I could get isn't perfect you can see the dad on the left and the two youngsters in the nest on the right. You may have to look some to see both brown youngsters in the nest. 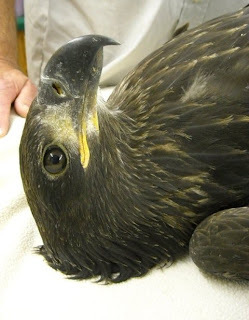 We are still not sure what happened to the eaglet, but continue to work to find out. She will have xrays Monday or Tuesday. More good news in a HUGE way from friend Barry Wallace. 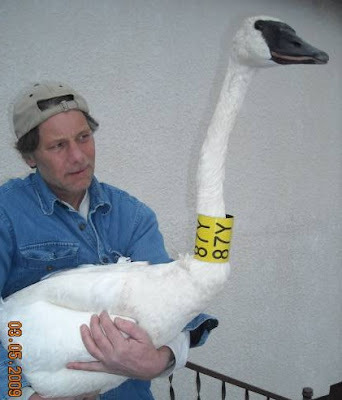 Barry is a consummate Trumpeter Swan watcher/protector/helper/health observer. 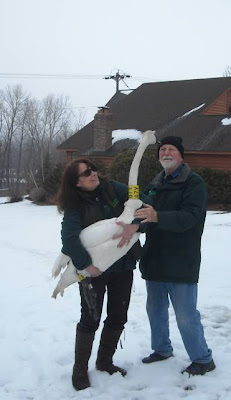 I cannot say enough good about the many years that Barry has spent with the huge Trumpeter Swans near Hudson, Wi where many winter, nor the valuable work he does with this endangered species. 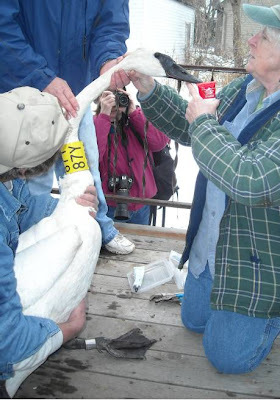 Last winter we were swimming in cases of lead poisoning in Trumpeter Swans. It was a miserable winter with long days and nights spent caring for these magnificent creatures. Lead poisoning is a horrible problem and with the high blood levels we were seeing in the winter swans nearly always fatal. We heard little from the bird. Barry had an occasional update, but it was on a no-news-is-good-news status. Yesterday I got an email from Barry. He found 87Y with a new uncollared adult female and they were looking pretty happy. That is GREAT news. We are not sure what happened to his former mate. She may no longer be alive. Swans mate for life or until some situation separates them. We are not sure what happened in this case. We hope 87Y is deliriously happy with his new mate and has an uneventful fall and winter this year. 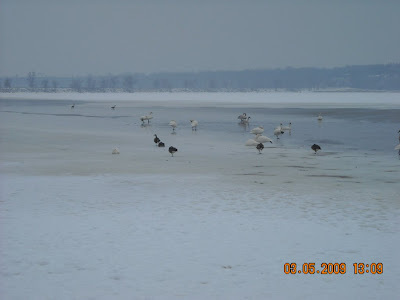 This swan episode and the other swan lead poisonings are documented in the blog in March and April if you would like to read them. More good news is our Red-breasted Nuthatches are ready for release. They will be released tomorrow if the weather holds. 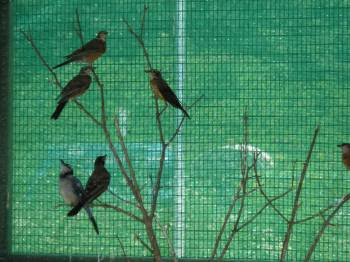 The Black-capped Chickadees are also nearing release ready as is the Chipping Sparrow. 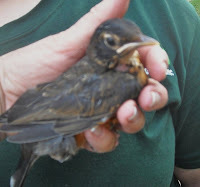 Many of the American Robins are also ready for release. We were waiting for warmer weather before opening the doors on the aviary and will do that next week after the Fourth of July celebration. Fourth of July and all the firecrackers and fireworks is not as exciting if you are a bird in a tree and terrified of the sound, the reverberation and the light show. The little Northern Flicker that was hit by a car is doing very well also. Flickers are such interesting youngsters. They are some of the "coolest" of the woodpecker babies and chat all of the time. They insist on hanging from you while you are feeding even when you wish they would not. Most years we have several nests of Northern Flickers by this time of the year. That occurs when trees are cut without people knowing tree contains a nest of the active woodpecker. The Barred Owl that came in June 23rd having been hit by a car and looked like she was about to give up on this world is in an outdoor flight and looks great. She still has a bit of a headache and will need to exercise to regain her muscle strength, but she looks great and her vision and hearing are perfect. 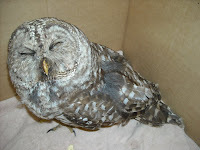 So many times when owls are hit by cars they lose vision or hearing and are then not releasable to the wild. Remember wildife when you use fireworks and loud poppers. Have a great and safe holiday everyone.